How’s the cookie situation in your house, this very Christmas-y morning? Are cookies and gingerbreads still piling up high on decorative plates? Or have certain types of cookies already vanished into belly nirvana? Somehow we manage to crown a new favorite Christmas cookie each year – this time around it was the lacy Florentine Cookie, the one I perfected to my liking some years ago. I roughly baked 20 trays, which appears to be a rather impressive number – but given their size, is actually not that much, since only 9 cookies will find space on a single tray. 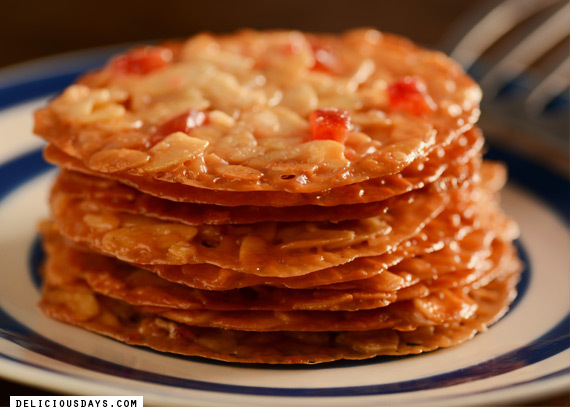 Mine have to be quite thin and I am aiming for the perfect combination of crisp and chewy. The chocolate part, on the other hand, has become dispensable, at least for me. 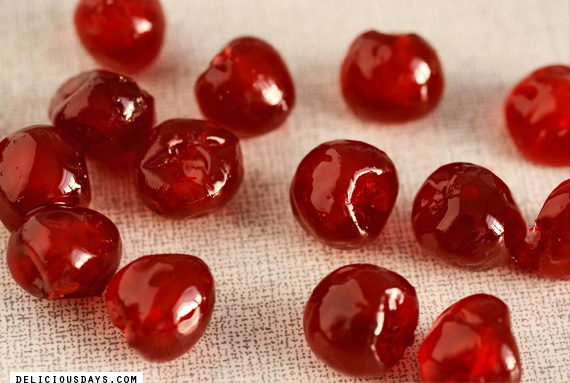 If you are not too keen on candid fruits, I recommend dried cranberries, which make for a very worthy substitute. Anyways, I wish you some very happy holidays, a wonderful time with your loved ones and a fab start to 2016! See you then! Preheat the oven to 190°C. Line two baking trays with parchment paper. Heat heavy cream, honey, both sugars, salt and butter in a pot and let cook lightly for at least 5 min. Meanwhile chop the dried/candid fruits to your liking. 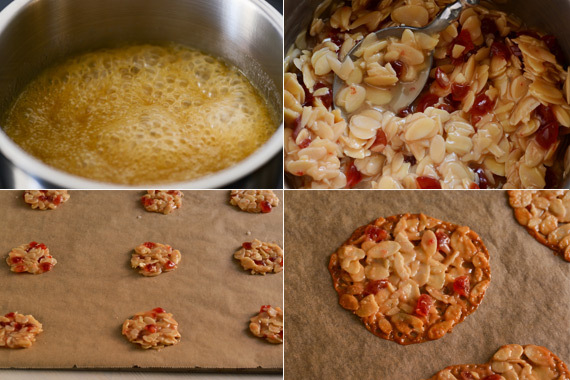 Remove the pot from the heat and add the chopped fruits as well as the almonds. Stir until evenly distributed. Now sieve just enough flour over the mixture until it gets rather dense – the consistency is perfect, when you can still stir it without breaking the almonds into pieces (a few broken ones are ok). Place little piles of the nut mixture onto the parchment paper using two teaspoons. Since the dough is spreading extensively during the baking process, I usually go with only 9 cookies per tray. Form the piles round and equally thick – a wet finger or the back of an oiled teaspoon works best for this task. 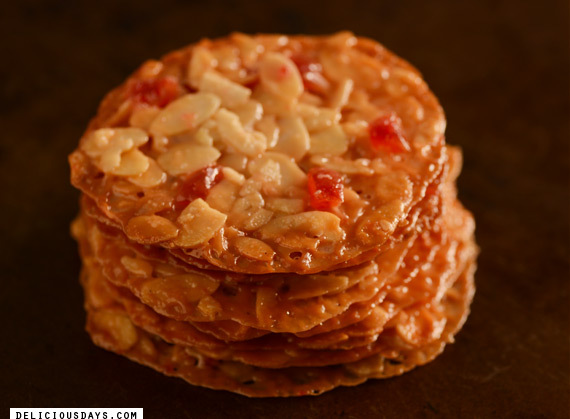 This ensures that the florentines turn out evenly thin and crisp. Bake for 7-10 minutes or until nicely browned around the edges, but be careful, it only takes a couple of seconds from golden to burnt! Remove from the oven, slide the parchment paper with the cookies onto a cold baking tray and let cool completely. Decorate with melted chocolate, if desired. Best eaten within days (keep in an airtight container, separated with layers of parchment or wax paper). Prep time: ~20 min. plus baking 7-10 min. This is amazing! I'd love to try these but perhaps without the flour and half dipped in melted chocolate! These cookies are easy, and delicious!! Thanks for the recipe!